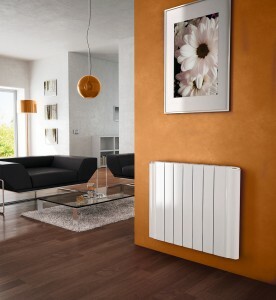 The Vantage is the highest quality Italian-made designer electric radiator in the UK. With no plastic end panels, and a special coating, the Vantage will never turn yellow. 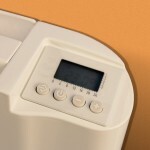 Low running costs, superior comfort levels, and lasting good looks are standard. Request a quote today, and save up to 10% with a package discount. Modern design, simple plug & play installation, full programming, and a state of the art energy management chip, makes the Vantage Electric Radiator the perfect choice for those looking for an affordable electric radiator. The Vantage encompasses our three key values of Performance, Efficiency and Design, at a low price, and with industry-leading quality. Take a look through the photo gallery, to see how the Vantage could look in your property. No plastic end panels and tough bonded coating. The Vantage is built to last. The Vantage Electric Radiator is made from the highest grade Italian aluminium alloy, to ensure a highly effective heat transfer, light weight, and a high quality finish. Welds are toughened and tested to high tolerances, to ensure that leaks are prevented in the manufacturing process. No plastics are used in the body, to prevent discolouration, and cracking. Click to see See the plastic versus aluminium comparison here. The aluminium surface is “E-Coated” (Electrophoterically coated). In a process similar to powder coating, E-Coating ensures a high quality finish – Superior to painted products because it is extremely durable, scratch resistant, and does not discolour over time. 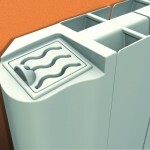 Vantage radiators feature a heated reservoir enclosed within the end panel. The reservoir is removable and accessible from the top. This may be used as a humidifier, or as a diffuser for scented oils. 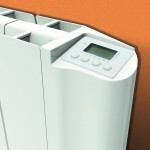 The Vantage Electric Radiator features intuitive, integrated control. It’s easy to use, and fully programmable. The controls and LCD display are handily located on the top of the radiator, to give a clean and modern appearance, with no buttons or display visible from the front. All control is accessible without the need to bend, or kneel down. A high-quality temperature sensor is located at the bottom of the radiator. Temperature and timing preferences can be preset across seven days, with a frost setting function, and even a locking facility, to prevent unwanted adjustments from being made. The Vantage is fully compliant with building regulations, and can also be used in bathrooms. Changing from storage heaters? Find out more here. 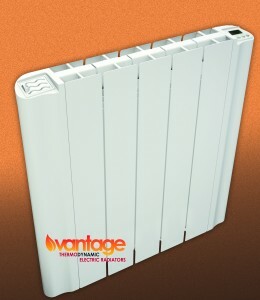 The Vantage Electric Radiator is filled with a thermodynamic fluid, which is highly efficient at transferring heat energy to the outer body of the radiator. The long-life heating elements are located at the base of the radiator. As the fluid warms, it circulates through the body, to ensure a fast and uniform heat transfer. Fluctuations at the temperature sensor probe are monitored, and the specific wattage input and heat output are regulated, to lower energy consumption. Take a look at the full specifications. A high-quality NTC temperature sensor and power manager reduce temperature fluctuation, and lower energy consumption. Find out more about running costs. 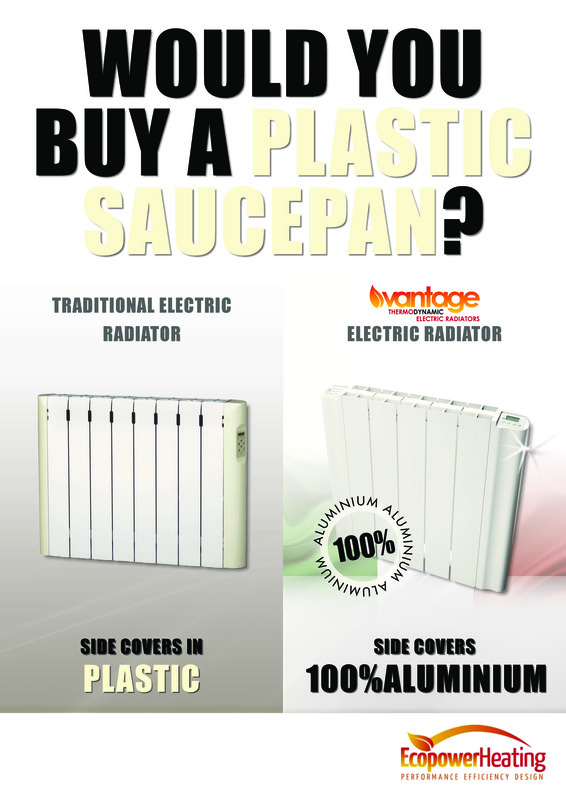 Become a Vantage stockist! For trade rates and assistance, contact us today 0845 4741478. 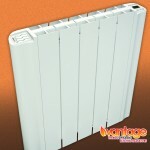 Prices for the Vantage Thermodynamic Electric Radiator are from £195.00+VAT. Package deals are available. Call, or contact us for more information. Ecopower Heating Radiators are not painted. Radiators that are painted fade fast. They scratch easily, and can turn yellow over time. Our radiators are finished with a tough coating, which is bonded to the metal surfaces using processes usually employed in the automotive industry. 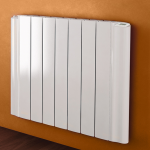 Ecopower Heating radiators are finished to the highest standards. They are scratch resisitant, and impervious to discolouration.